Acquired by Colonel Norman Colville M.C. (1893-1974) and by descent. Despite the difference in colour, the leaves appear to be original. 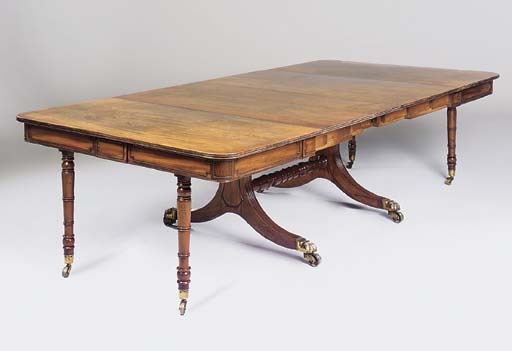 This ingenious form of dining/occasional table was invented by the Norwich cabinet-maker Benjamin Palmer Titter (d.1830) following the establishment of his St. Simon's Street premises in 1810. The same pattern of Grecian sofa-table trestles, terminating in bacchic lion-paws, feature on a closely related table bearing his brass plaque and the inscription 'B. P. Titter, Inventor & Manufacturer, No. 4 St. Simons Norwich' (sold Sotheby's New York, 26 January 2000, lot 266).